Justrite and Jamco flammable cabinets. 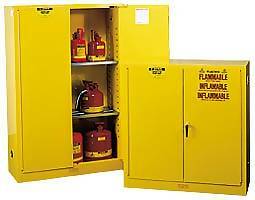 Store flammables in flammable safety storage cabinets, safe from fire or potential explosion. Safety Cabinets make storage safer and more efficient for flammable materials stipulated by OSHA and NFPA regulations. Models include manual, and self closing doors. Security cabinets store items safely and securely from pilferage and unauthorized access. that make organization a snap. Rest easy knowing flammables are stored properly with our cabinets.